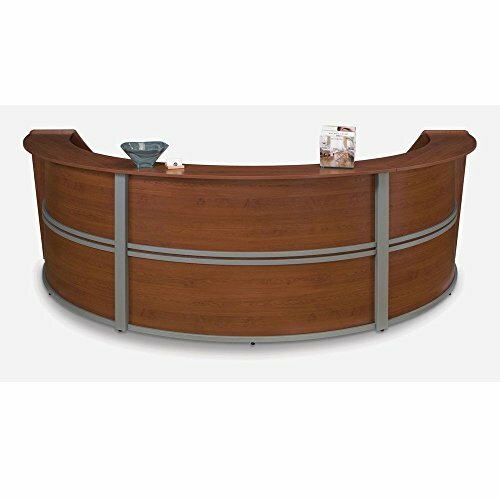 Marque Curved Triple Reception Station - 142"W x 69"D Cherry/Silver Accents Dimensions: 137"W x 69"D x 45.5"H Weight: 356 lbs. OFM Marque collection triple reception station is constructed of durable, commercial-grade engineered wood with an attractive laminate finish in your choice of three colors; Reception station features striking silver accents that enhance its eye-catching modern style. Integrated wire-management cut-outs reduce clutter from wires and cables. Work surface inside desk is a generous 19"D. Top transaction counter gives guests a convenient writing surface and is 13"D; Ships ready to assemble, no tools required.